40 years after the events of John Carpenter‘s original Halloween Laurie Strode (Jamie Lee Curtis) has been preparing for her final confrontation with The Shape, and when he escapes from captivity she finally gets her chance at revenge. David Gordon Green helms this direct sequel to the original 1978 classic and you can tell that as well as being a sequel this is a love letter to the original written by fans of the franchise. 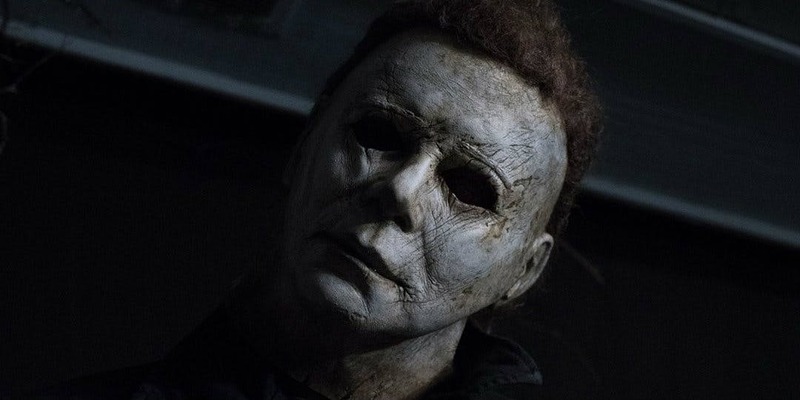 Halloween is littered with visual and audial references to the original that add to the enjoyment for fans of the franchise but aren’t at all jarring for someone who is coming fresh into the franchise. I love the callbacks from the various shots calling back to moments in the original to the presence of John Carpenter’s iconic and still chilling theme. The story being told here is thrilling and a return to the slasher films of old but it’s still very much in line with how a typical slasher film would progress. The pacing for the most part is pretty spot on, the first act has a couple of rough patches where it’s a little up and down in the process of setting up Laurie and Michael’s paths to cross. But once the second act kicks in it’s a straight path to the finish line and it only gets better and more intense from there as Michael leaves behind a trail of blood and destruction. Once I got a feel for the new characters and where things are heading I was hooked and on the edge of my seat right through to the end. The most engaging moments are those that focus on Laurie where you get to see what living in fear for 40 years does to a person and their family. How she’s been training and what she is going through now that Michael is once again on the loose is a fascinating story point that I would have loved to even see a little more of. Some of the stuff revolving around Laurie’s granddaughter Allyson (Andi Matichak) I wasn’t as highly invested in but I still found her journey in this story interesting. The star of the show however is and will always be The Shape. Halloween is his night and he has waited 40 years to continue the killing spree he began and never got to fully see to its conclusion. This is his movie and watching Michael navigate the world leaving bodies in his path makes for a tonne of haunting fun. He’s a terrifying figure looming in the darkness and you never know exactly when he’s going to strike, but what you can be sure of is that it’s going to take a lot to stop him. The way he is shot as he moves through this film is fantastic because you get enough of him but never so much that the camera is always fixed on him. Green makes this great creative decision where the camera is rarely focused on Michael, instead it’s the house, the street, or the environment he is in that the camera moves through and Michael you always know is somewhere close by. It gives every scene this heightened suspense harking back to the tone of the original. The cinematography as a whole from Michael Simmonds is stellar with a number of well shot sequences standing out to me long after the credits began to roll. The confronting nature of how the brutal action sequences are shot is fantastic as it’s all in line with the character and the regard he has for human life. Jamie Lee Curtis’ return is one of the biggest draws of this sequel, seeing her jump right back into her most iconic role without the burden of the sequels weighing on her is awesome. And she plays the role so damn well, from the moment she first shows up on screen I’m like this is a very different Laurie Strode but an understandably different Laurie considering what she’s gone through. She’s gritty, intense, and determined to get her revenge and Jamie sold me on that in every one of her scenes. Judy Greer plays Laurie’s daughter Karen and she has a good arc throughout the story in how it focuses on her fractured relationship with her mother but I did find her to be one of the least intriguing characters. She was fine as a secondary character I just wasn’t as engaged in her journey as I was Laurie’s or even Allyson’s. Andi Matichak who plays Allyson is fine in the film, to be fair as the majority of the focus is on Laurie and Michael she doesn’t have a whole lot to do but she puts in a good enough performance to where I wanted to see where some elements of her story went. In the end, Halloween which is the direct sequel to Halloween (if that makes any sense) is a great slasher film that takes the franchise back to its roots and gives us the sequel we have deserved. It has a great story, brings in great new and returning characters, is a thrilling ride right to the end, and is about as good as I think a Halloween sequel can be after so many subpar attempts. Fans of horror should love this film which breathes new life into the now pretty dormant slasher genre without really bringing much new to the genre which is both confusing and impressive. It suffers from some early pacing issues and a couple of story arcs not being too engaging but overall is a thrilling story that doesn’t disappoint. The Shape is still a brutal force of nature and it’s worth checking out just to see him in action once again.